Hi there, the end of this month is chock full of information and blog posts as I took a little break and came back with a ton of things to share and also this meant that the Maker of the Month feature is way later in the month than usual. I do hope you forgive me for this and so here goes! I first learned of Michelle and Berry Colorful Yarnings when I was in the yarn subscription club The Golden Skein (no longer operating). Every three months I would get three skeins of hand dyed yarns, each from a different dyer and one of those was Michelle. Since then I have been following her on social media and of course on Etsy where she sells her yarns. Michelle specializes in self striping yarns and as a sock knitter, I find that super exciting! Somehow, self striping vanilla socks seem to knit up on their own, one is always so excited to get to the next stripe! A while ago I contacted Michelle and she kindly accepted to do a little yarn swap and so I was lucky enough to get to try out some more of her yarns. 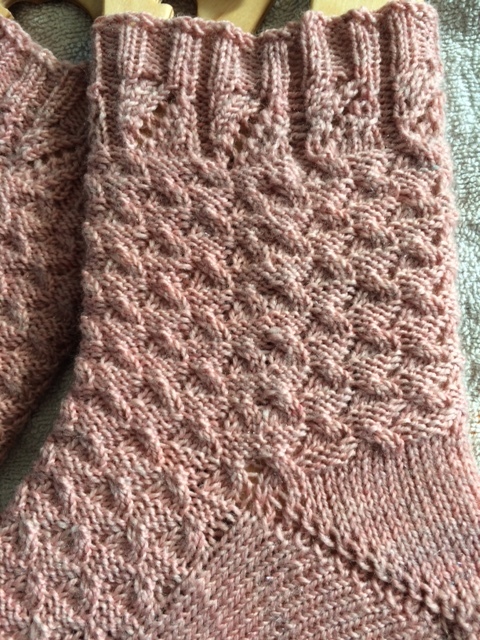 This is the pair of socks I knit out of the first skein. I used my own hand dyed purple yarn for cuff, heels and toes so as to not disrupt the striping. I knit these from the cuff down and did an afterthought heel as I often do when using self striping yarn. Michelle’s yarn is a pleasure to knit with and her sense of color is amazing. I have a few more of her yarns in my stash and cherish them very much! And I thought it would be so fun to interview Michelle and introduce you to her and her work if you don’t know her already. And she kindly accepted the interview AND a giveaway! So you just might be lucky enough to win one of her yarns yourself! I see from your about page on Etsy that you opened your shop in 2011. Had you been dyeing yarn before then and selling elsewhere or is 2011 the year it all started? 2011 was the first time I had sold anything I had dyed and I started off with my etsy shop right away. How did you come to start dyeing yarn and then selling online? I have always been a lover of indie dyed yarn and I was buying yarn from international dyed but the shipping times and costs at that time were starting to add up. I had mentioned to a knitter friend of mine that “I wished I was talented enough to dye yarn” and her replay was “you are” so after chatting with my husband I jumped in feet first and haven’t looked back! Do you work as an indie dyer full time or is this a part time thing ? Dyeing is a part time thing for me. We homeschool our two girls and I help my husband run his business. Where do you get your inspiration for your colourways from ? I get my inspiration from many sources but I really love pulling colors from nature. There are some really beautiful combinations right in front of our eyes. I love when a customer brings me a photo and asks for a self striping yarn from it. This really allows me to be creative. What is your most popular colorway? and/or most popular yarn base? The most popular colorway has to be The Pats doorway, themed for the New England Patriots Football team. Second would be either the 12 color Rainbow or the 12 color 12 days of Christmas colorways. I know you are most known for dyeing self striping yarn. How did you come to choose that type of dyeing method/yarn? Do you also sometimes dye tonal or semi solid yarns? Currently no.. but after the first of the year my plan is to bring that option back to the shop. After getting the husband out the door, I get any business related emails and paperwork needed done. I get the girls schoolwork done and then some lunch.. if we don’t have a ton of activities for the day then off to the dye studio I go.. I get lost in the fun of color. What have you got planned for Berry Colorful Yarnings in 2017? and where do you see your company in say 5 years from now? 2017 for BCY will be a slower year. But 2018 is hopefully going to see a few fiber shows and crammed full of new color combos and maybe even some fun new stripe tech. Where does the name of your shop, Berry Colorful Yarnings come from? Berry is my last name, Colorful for what I strive to always make my yarns, and Yarnings was what my youngest daughter would call anything I was doing with yarn or fiber, so Berry Colorful Yarnings happen to just fit so nicely!! And a little about yourself, where do you come from/live? I live in southern New Mexico, I spent 11 years here as a kid (military kid) then in 1996 my husband and I moved to CA and lived there for 17 years. We moved back to this area a few years ago and love it here. Are you a knitter and/or crocheter? I learned to crochet as a kid but didn’t learn to knit until 2009. My middle niece showed me how one summer. When did you learn to knit/crochet? Crochet I was about 10 and 2009 is when my niece showed me how to knit.. 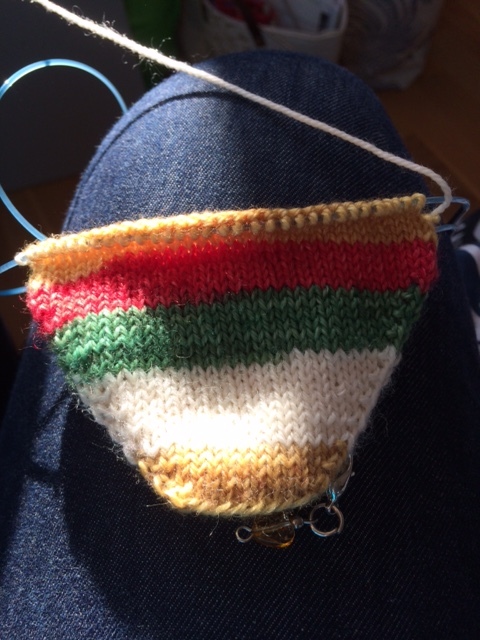 I just recently became a sock knitter, that is why my stripes are a bit wider than some. 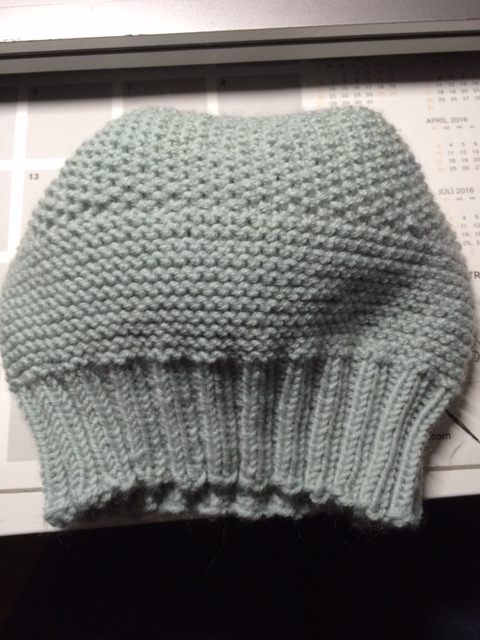 I needed to be able to knit my own yarns into a hat or cowl. I love love to knit hats!! If you are a big sock knitter, do you have a go to pattern/recipe? I love a toe up vanilla sock at the moment! Do you knit socks cuff down or toe up? What is the best way for people to follow you on social media? Do you have a blog? Thank you so much Michelle for taking the time to answer my questions and giving me and my readers a little sneak peek into your life. And an even bigger thank you for donating a yarn for the giveaway! Michelle has donated a skein of her Daisy colorway that I show you here below. Hi there, how are you? I hope you are doing better than I am since I have a big cold and have totally lost my voice! Apparently that is going around these days. So, I know I told you last time that I was going to concentrate on finishing all the wips BEFORE casting on for new stuff. Well….how can I say this?…..I totally failed! I have cast on sooo many projects that I have to do at least two posts to share everything with you! So today let me show you three projects that I have just finished. The first one is a pair of socks for my older daughter. 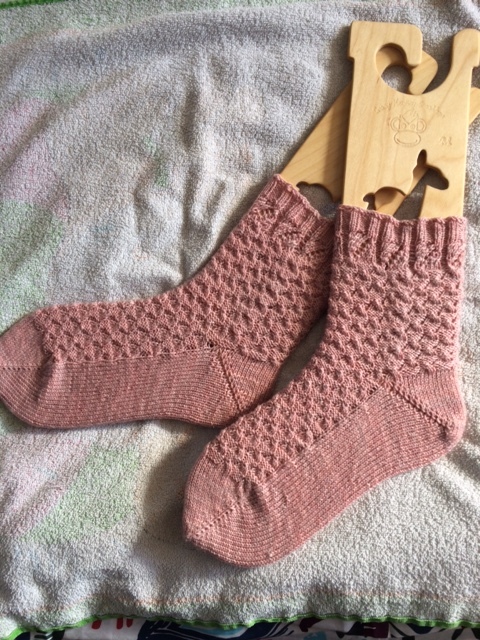 I used my hand dyed SOX and SPARKLES yarns and just did a simple vanilla type pattern, knit from the top down and did a short row heel. I also did cuff, heel and toe in contrasting color to hold the pattern of the variegated yarn. I’m really happy about how they turned out. 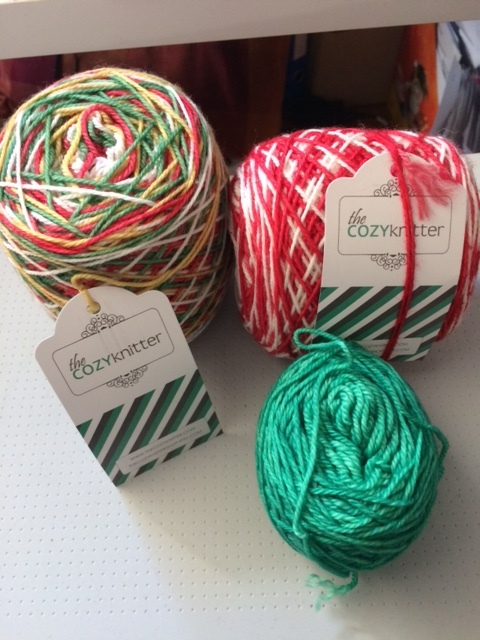 The color way for the variegated yarn is called Another Kind of Christmas. I dyed that up in December and put up for sale in my independent shop (which by the way is not working out so I really need to list the yarn there on Etsy). And I believe last time I also told you about doing a double experiment, dyeing self striping yarn and using NEKO knitting needles. Well I finished my first pair using the Neko needles and my self striping yarn. As for the needles, they are nice BUT not transcendent, not enough to make me want to knit only with those. The idea behind them, I feel, is like knitting with 2 circulars so if you like knitting your socks with two circular needles you might enjoy the bent Neko needles. I do find that my gauge is looser when knitting with the Neko needles than when I knit with dpns or circulars. I think that it might be because of the shape of the needles and that I was not able to find the perfect way to hold them. 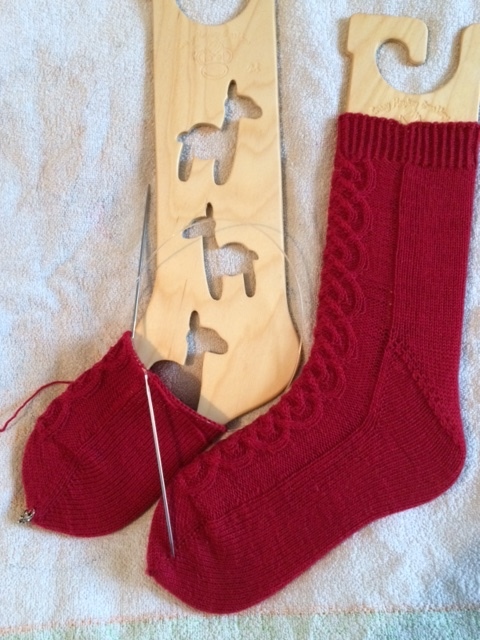 The only problem though that I had, was when I was almost at the end of sock number two. 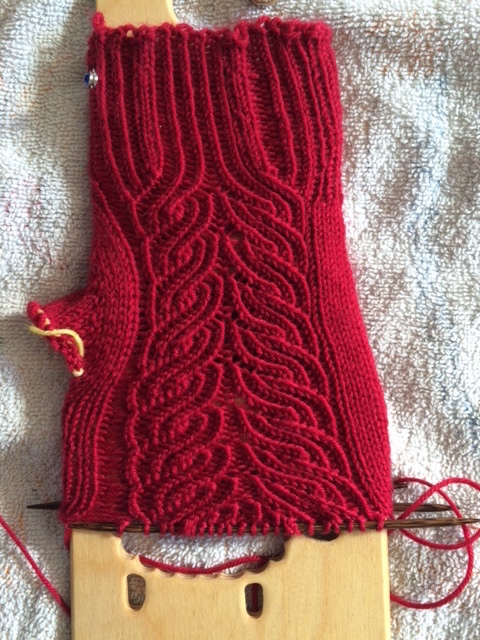 I had begun de toe decreases when all of a sudden one of the needles broke! I was sitting at my desk so I immediately took a picture and sent to the manufacturer asking if this was a recurring problem with their smallest size and if they guaranteed their needles and would send me a new one. They answered very quickly and said that this did not happen often but they would be sending me a new set of needles. I was very happy with that and just transferred half my stitches to a different needle and went on to finish my sock and then….a second needle broke! I hope I will have more luck with the new set that they sent me! I don’t think I used too much force and the needles were not bent out of shape so I’m thinking maybe the 2mm size/0 US is just a little too fine for the plastic material they use for the needles. But anyway it was a fun experiment and I have cast on for a second project using the next size (2.50 mm) and those feel sturdier so cross my fingers and hope they will not brake. But now I think it is time for some pictures. First off some pictures of the dyeing. So I wanted to do a self striping yarn. I have heard that a lot of dyers do not do those because they are soooooooo time consuming. And I can definitely confirm that. I will need to research methods to speed up a little the process if I want to offer those in my shop otherwise they will just not be worth it because I’ll never be able to sell them at a profitable prize. So I actually did 2 self striping tests and this was the first one. So I decided to do a regular skein and wind it up into sections that would then be dyed in different colours. I used a yardage measuring device to help me wind the same amount for each section so that the stripes would be as equal in size as possible. Then I put each section into a little plastic bag to keep them separate. I then wet the yarn and took each section/bag and poured the dye on. When all the sections were dyed, I put them in the pot to steam set. Here the yarn is just out of the dye pot and drying in front of my fireplace. You can see that the sections are connected together because I did not cut the yarn. Also I dyed the skein “single” I mean that I did not wind the yarn double to make two identical skeins for one pair of socks but I actually dyed one skein, single wound, to make one pair. Here the yarn has dried and this is where the “fun” starts. You have to wind the yarn on a niddy noddy to make a skein that can then be sold or in my case put on a swift so that I could wind it and knit asap. Here is my yarn all skeined up and looking gorgeous. And here it is wound up into a cake. The Neko needles you see are not the ones I ended up using. These are 2.50 mm and I found that my gauge was much looser so I would have ended up with humongous socks so I ripped back my first cuff and started over using the 2.00 mm needles. Here you can see my stripes forming. I had 8 colours and each stripe measured 10 yards. That was ok this time as I was knitting a 64 st sock but I do think the stripes should be smaller because at this yardage, you can only really knit large socks, anything small would not really be a stripy sock but a sock with colour sections. So what I learned from this first test was that I CAN DO IT! and that I need to make the stripes smaller. I also realized how much time it takes from start to finish to make a single skein of self striping! But I admit the process is fun and I’m really happy with the outcome. Again I did a simple vanilla, top down sock with a short row heel. I also dyed a small skein of yarn in a different colour to use for cuff, heel and toes so that the stripe pattern would not be broken up. And it worked perfectly. And here they are! All done and gorgeous:) I’m most proud of the fact that I was able to make a totally matching pair of socks even if I did not dye my yarn double. That is way more difficult than dyeing a small skein double where you are totally certain that the colours are going to match up. So I’m really happy with this. 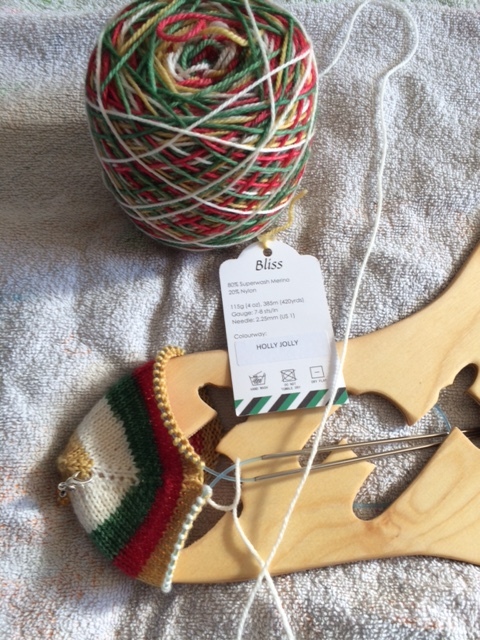 And I did enjoy using the Neko, bent knitting needles and I’m going to knit some more on those. Wow that was a lot! But before I leave you I have one more project I want to share with you. My daughter has a friend who is going to celebrate her 10th birthday this weekend and when my daughter asked her friend what she would like for her birthday the friend said: a hand knit, hand dyed hat and a hand knit mermaid tail blanket! WOW! I learned this Wednesday and the birthday is Saturday!!!! Of course I’m super happy that she loves my knitting. I have knit her a pair of socks she adores and apparently she wants more! So who am I to say no? Well, first I wanted to be reasonable and so I said to my daughter, ok I can do the hat but I will not have the time to do the mermaid tail blanket. That was not good enough!!!! But more about that later. It just so happened that I had dyed a little bit of some DK Cash’merino yarn and so I took a skein and wound it up, found a pattern on Ravery called “Gentleman hat” and cast on. I need to make a pompom as that was part of the wishlist. The pattern is fun and very easy so this was a quick knit. 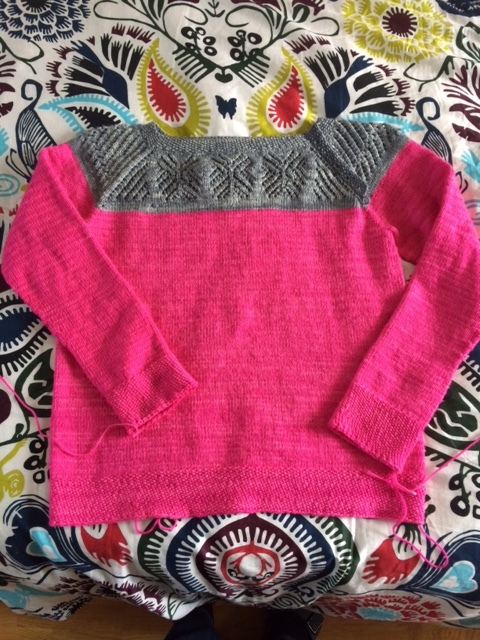 I knit the child size and the only critique would be that the ribbing should have been longer, I should have thought to make it longer myself…but I didn’t but hopefully it will still be ok. I like how the colour shows on the hat with lots of white and then some red, some pink and some purple and I hope the little friend will love it! And then there is the mermaid tail blanket!! When I showed my daughter the hat I told her we needed to find something else to go with the hat and she said NO! She only wants the blanket! And I said; I’ll never finish in time. But my daughter has an answer for everything so she said ” not a problem, its ok to give the rest of the gift a little later”. Being the knitter I am, I of course folded an found some yarn and cast on last night! I’ll show you pictures next time and a link to the pattern if you too have been thinking about doing one of those yourself. That’s all for today. I hope you enjoyed stopping by and sharing some time with me. I’ll try to be more regular in my postings. And next time I’ll share my mermaids tail blanket as well as pictures of my second self striping dye sock knitting test and….. the 3 yes I did say THREE MKals I just joined! Talk about NOT casting on any new projects before all the WIPs are done! Clearly I’m not very serious! Hi there, how are you today? I hope you are doing great and enjoying your week. Today I’m going to share with you my double testing. If you follow me on social media you may have seen pictures of my latest sock project and my self striping yarn. This week I decided to do some dye testing and make a self striping rainbow yarn. I used bright colours, eight total. Each stripe is 10 yards long which at my current gauge makes for 12 rows of 64 stitches in stocking stitch. Here are some pictures of my project. I measure out my yarn and wind on a warping board. I dye each “mini skein” a different colour. There are 5 repeats of each color except for the first and last mini skein/color where there are only 3 repeats. Here the yarn is drying in front of my fireplace. Here the yarn is all dry and ready for me to wind it into a skein using a niddy noddy. All wound into a gorgeous skein. Next time I think I will make shorter colour repeats and possibly do two skeins which is perfect for taat socks. My yarn all caked up and my new knitting needles! I just heard about these new German knitting needles called NEKO. These are plastic, bent knitting needles made for socks and they also have larger sizes made for knitting hats and “loops”. I had never heard about these before so I was super intrigued. These needles come in sets of 3 and are quite hard to find. In Europe they can only be bought from the producer directly but there is at least one shop in the US and one in Canada and I did find one shop on Etsy carrying these. So I contacted NEKO and bought two pairs of sock needles and they gifted me with one pair of size 8 mm/US 11 for me to test. Lucky for me, the needles arrived the day my new self striping yarn was dry and ready for knitting so of course I used that yarn to cast on for a new pair of socks and test both yarn and needles at the same time. I really like the yarn and I managed to make the colour repeats consistent but I do feel they are slightly too long. It’s still ok for a 64 st sock and will be for a 72 st sock. However they will be too long for a smaller size sock, 56 or 60 st sock. So next test I will do shorter repeats. As for the NEKO knitting needles I need more time before deciding if I like them or not. They are made from plastic and they are V shaped which means you will not loose any stitches when putting down your knitting. Each set comes with 3 needles, two hold the stitches and the third is for knitting. I find that my gauge is a lot looser with these needles than it is when I use “regular” dpns or circulars. The needles in size 2mm/US0 bend a little with the force of my hand/fingers. Otherwise they are quite easy on the hands. What I need to figure out is how best to hold them. The fact that the needles are bent means that they are sometimes “in the way” of my hands. I’m making good progress on my sock and liking it so far but need to work on positioning the needles better in my hands. 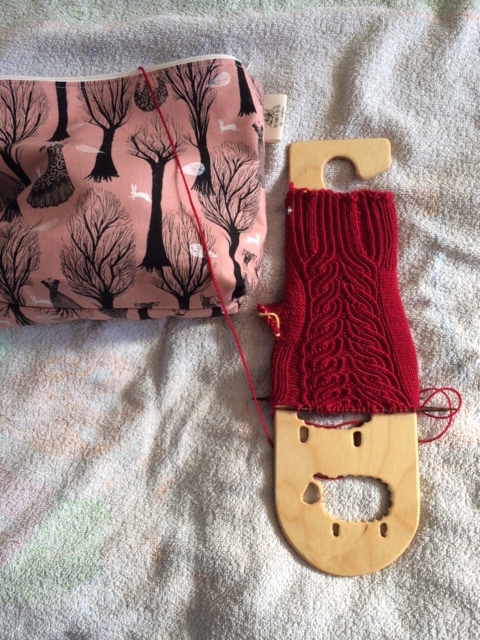 I’m using a contrasting colour for cuff, heel and toe – the plum colour. Have you ever used NEKO needles? Would you be interested in trying? I’m going to finish my pair of socks before making a decision about wether I like them or not and if I should buy some to sell in the shop. And speaking of knitting needles, what type of needles do you use most? For me that would be circulars which I use for almost everything.